100% Hidden Fasteners for a clean & professional look, Fast Track is Screen Tights' innovative 2 piece screening system. With unlimited screening configurations possible Fast Track's 1" x 2" self-mating channels available in 8' length, create porch structure elements for easy installation and limitless project creativity. This unique aluminum system allows you to screen from the interior or exterior of your porch using flat spline, in less time. 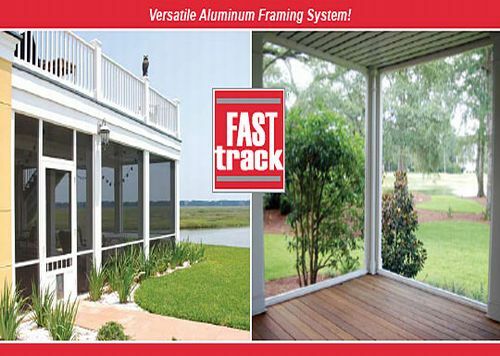 With so many benefits, the solution is simple... Fast Track™ the versatile aluminum Framing System! 5/16 flat spline comes in a bulk project pack of 300 feet in an easy to dispense container for easy storage, preventing tangles and material waste. 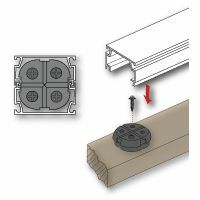 Fast Track™ is the100% Hidden Fasteners, unlimited screening configurations, versatile aluminum Framing System. Mark clip positions around the frame keeping clips aligned for proper channel installation. Attach clips a maximum of 4" from corners and 14" - 16" apart using #10 x 1 1/2" stainless steel screws. Cut FASTtrack channels to length and snap over clips using a rubber mallet, installing the vertical channels first followed by the horizontal channels. One of the unique features of FASTtrack channels is that the 1"x2" channels snap together to form a 2"x2" post or rail. Install vertical posts by attaching two clips stacked together in the desired location on both the top and bottom of the frame using #10 x 2" stainless steel screws and then snapping the two FASTtrack channels to the clip using a rubber mallet. Step - 4 - Install horizontal posts in a manner similar to step 3 using 3" screws to attach to the porch frame and #8 x 4 1/2" zinc plated screws with nylon nut to attach the rails to the vertical posts. Using the flat spline, Pro Rollerknife™ Screening Tool & fiberglass screen; Simply roll screen into the grooves located on either the interior or exterior of the porch. Starting with the top, working your way to the sides and bottom of each section to be screened.